In an endnote in the chapter about The Stand in The Art of Darkness, Douglas E. Winter mentions a dystopian novel called The Long Walk “which owes much to Stephen King.” Was this an inside joke between King and Winter, who had interviewed King extensively for the book, or an astute observation on Winter’s part? Winter does talk about The Long Walk briefly in The Art of Darkness as one of King’s early novels, but without identifying the book by name. At the suggestion of his college professor, Burt Hatlan (one of three University of Maine professors to whom the book is dedicated), King showed the manuscript to another member of the English department, Carroll F. Terrell. Terrell recognized King’s promise, but struggled with how to convey his feelings about the novel. He thought The Long Walk was a first novel, but upon further reflection, he realized it was too expertly executed for that. It was exceptional on many levels, but there wasn’t any chance anyone would publish it, he believed. He didn’t want to discourage King from writing something else, perhaps something more topical and relevant to the era, and he ended up providing chapter-by-chapter feedback on King’s next book, Sword in the Darkness. After Bill Thompson delivered the news that Doubleday was going to pass on Rage, King sent him The Long Walk, which went through much the same process of editorial feedback, revisions and ultimately a thumbs-down from the editors. Several years later, Elaine Koster, his editor at New American Library, asked for a follow-up to Rage and he dug The Long Walk out of the trunk. 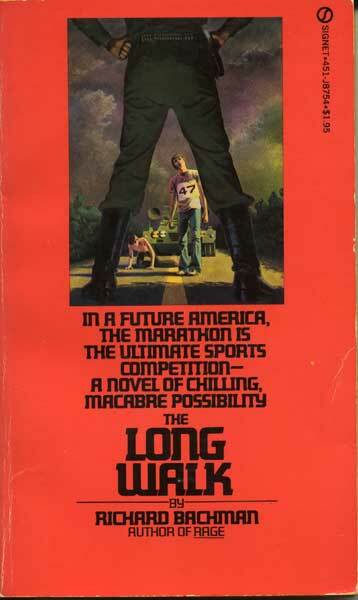 The Long Walk was released in July, 1979 as a paperback original, with a $1.95 cover price. A number of faculty members at the University of Maine knew the truth behind the Richard Bachman pen name, but they kept King’s secret. Though it didn’t make many ripples in the publishing world, the book reportedly remained in print for six years and developed a cult following. When the Bachman pseudonym was revealed years later, a bookstore chain bought up all of the remaining copies, essentially putting it out of print. A month after its release, Viking would publish their first Stephen King novel, The Dead Zone, to far greater acclaim. “Five to One, One in Five”, Hearts in Suspension, University of Maine Press, 2016. Just finished rereading this (having first read it in the 80s). What a great book! Yes its juvenile but then – in these days of “YA” fiction – how current does that make it now? King was playing to his strengths with this one – writing what he knew. He was a teen himself. Contrast this with the horribly clunky way he writes teens now (I’m thinking Abra in Dr Sleep and the teen geek genius in Mr Mercedes). I’d forgotten about this book. My gratitude to the rereading project! Just recently reread this. Great gut punch of a story that seems more timely than ever. Hope Darabont gets around to filming it someday. Great news on this one. Wonderful info. This story always gave me the chills…still does. Haven’t read this in a LONG time, but I remember absolutely loving this book and it is pretty timely in this day and age. GREAT premise. Hunger Games anyone???? I actually think this is an amazingly powerful novel. I rank it as top-tier King.